Any impressive, larger-than-life backyard display has to include this 12 shot finale with colorful glittering tails and silver chrysanthemum blasting into the night sky! 36 shots of huge silver dragons flee in disorder,red and blue dahlia with bang, colorful fish,purple and green dahlia with green tail,red /green crossette to green falling leaves and crackling rain,gold shuttle tail to gold shuttle with red and green glitter. 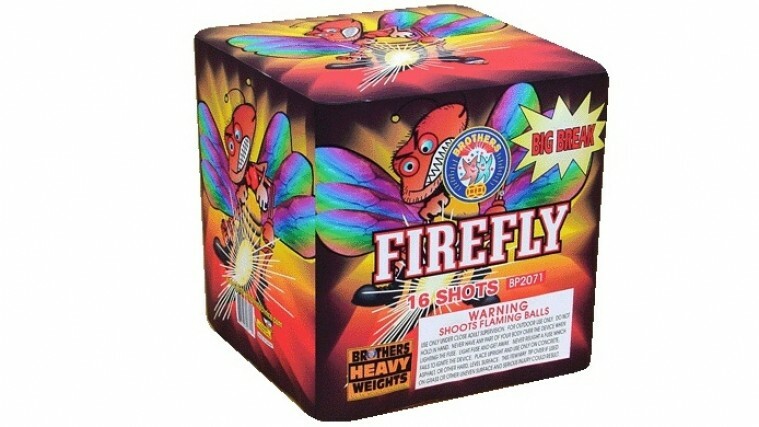 Firefly will burst into action with red, silver bouquets and blue stars with crackling flowers. This is a fun cake and sure to be a hit. Gold Dust is a fascinating display of glittering gold dust mines in stepper format. Try Gold Dust and you will be back for more of this gold. Double willow waterfall with blue pistil; double brocade crown waterfall with red pistil; silver palm tree with green fish mines; finale with king of brocade crown. 28 shots. 8 shots: 1.red with sky blue and silver strobe; 2.purple & lemon with silver strobe; 3. purple & green with silver strobe; 4.red & green with chrysanthemum. 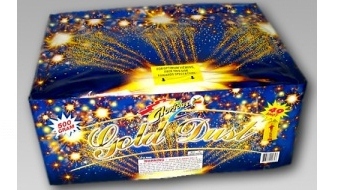 Hot Head by Legend Fireworks is a masterful 35 shot 500 gram cake. Check out the video on this bad boy.